Glasgow, the largest city in Scotland and one of the friendliest, hasn’t always had such a positive reputation. Once a major shipping port and industrial center, Glasgow, like many big cities, had issues with overcrowding, sanitation and violence. Since then, Glasgow has gone through major changes and re-branding. Fabulous shopping and restaurants, Glasgow University and the School of Art have become major attractions to the city, boosting Glasgow tourism. 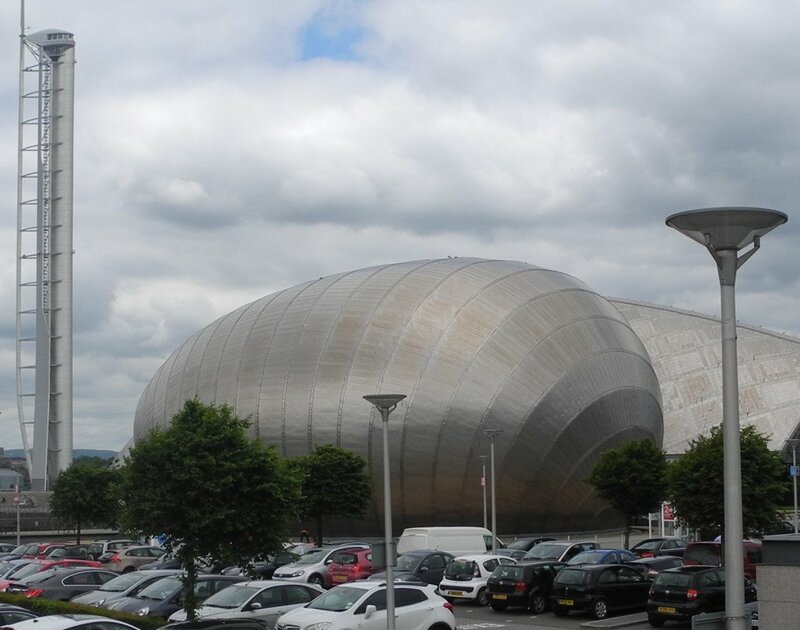 In fact, in 2008 Glasgow was named UNESCO City of Music. So, when my husband had the opportunity to work at the Glasgow University, we jumped on it! This would be our family’s first international trip together, the first visit to Europe for me, the kids and my parents, and the longest flight we had ever taken with our small children. It was a big deal! We were going to Glasgow with kids! Once tickets were purchased and accommodations were booked, I immediately went into research major mode. I asked friends who were from Glasgow for tips, watched travel shows like Anthony Bourdain’s Part’s Unknown, and blew up Google. I learned about its rough past, the rivalry between Glasgow and Edinburgh, and its many cultural centers. 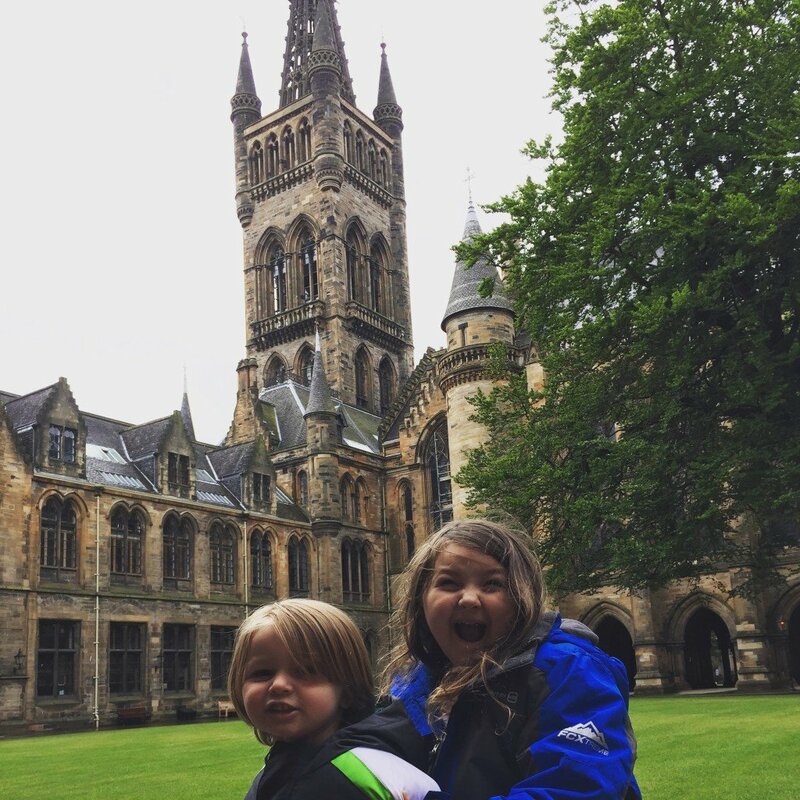 Research is great, but real life experience is better and after almost three weeks in Glasgow with kids, I can say from personal experience that this is an awesome city and I officially love Glasgow!!! Remember the currency conversion. I had to go from dollars to pounds. So, to make it simple I calculated my budget as whole to pounds so that I wouldn’t have to mentally convert every purchase. For example, if I brought 4,000 USD to spend, I really only have 2560 GBP to spend. You need cash to tipping and for taxis, but other than that you can use your ATM card or credit cards for transactions. If you can, get a credit card with no foreign transaction fee, like my Delta Skymiles AMEX. See more on my money saving tips for travelers post, HERE. Don’t convert money at currency exchange places. I just took money out from the ATM. If your bank has partners in the UK use those ATMs to avoid extra fees. Share meals and avoid having three meals out. 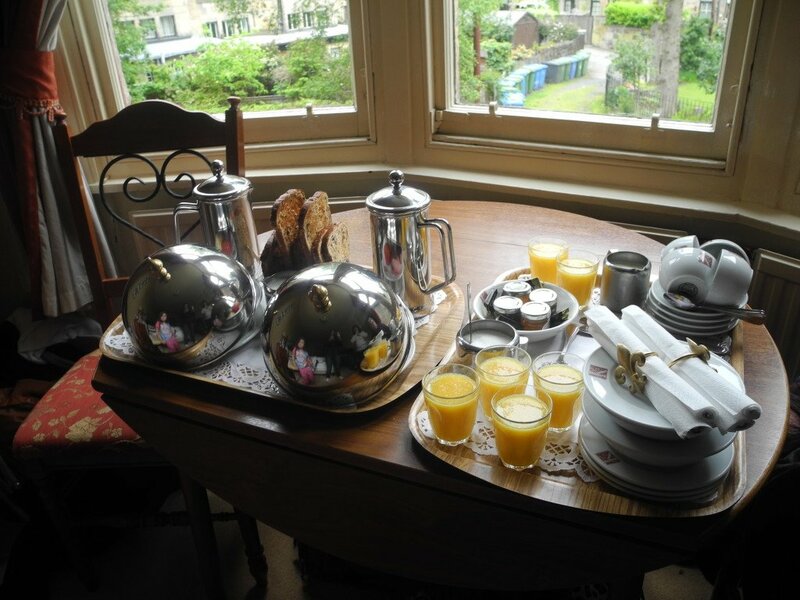 Many hotels in Glasgow offer free breakfast with your room rate, which is great for saving on meals. No need to rent a car, public transportation is cheap, reliable and efficient! 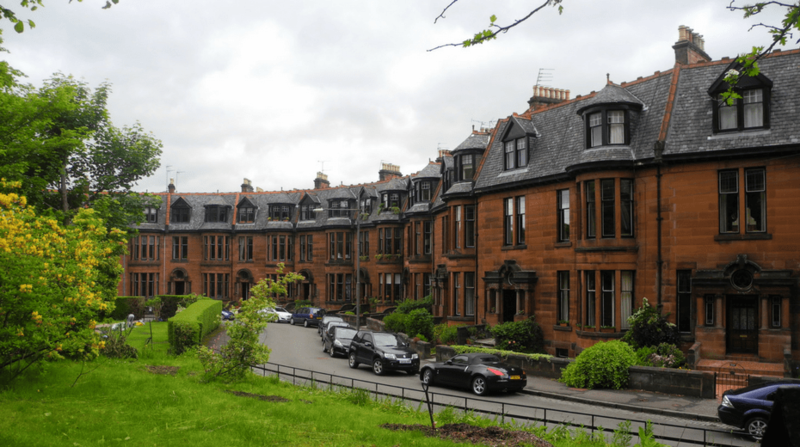 Glasgow is huge, so first you’ll have to decide what area of the city you want to stay in. 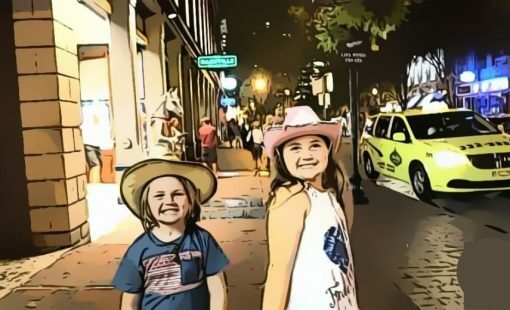 West End is the nicest area to stay if you are traveling with kids and anxious grandparents. I really liked the location of the Hilton Glasgow Grosvenor Hotel, because it was right on the corner of Byres Road and Great Western Road; walking distance from all the fabulous Glasgow West End attractions. Check rates and availability. If you would like to stay in the City Center, a great option is the Radisson Blu Edwardian. Located in the Financial District, it is mostly designed to accommodate business travelers, but it works for families too. I like that it has great access to Glasgow transportation, like the bus, railway and subway systems. It is even a stop on the City Sightseeing tour bus. 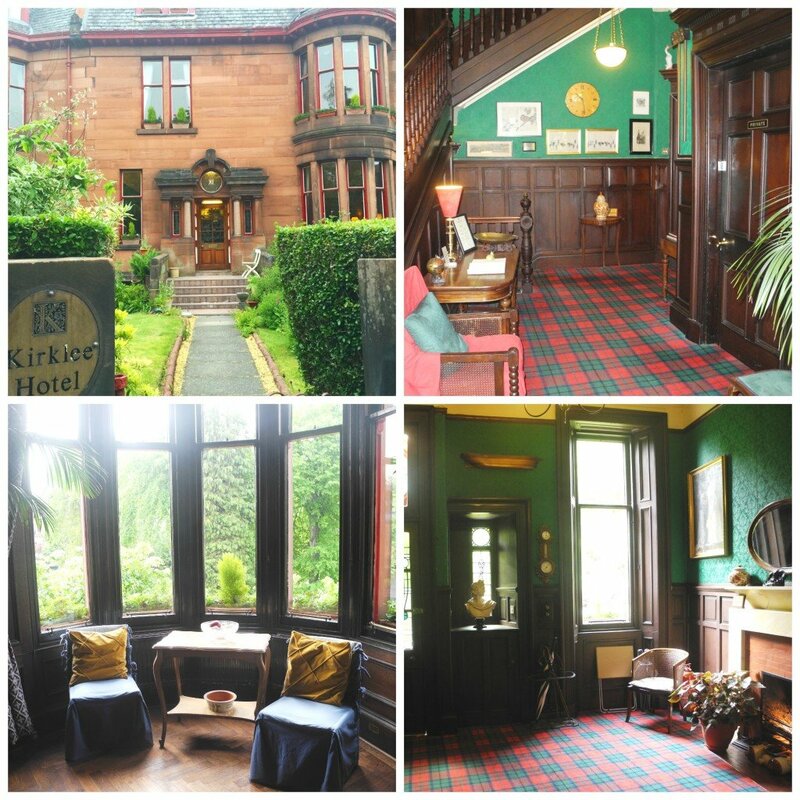 We, however, went for a more authentic Scottish experience and booked our stay at The Kirklee Hotel, an Edwardian style townhouse built in 1901 just off of Great Western Road. We really enjoyed our stay and I posted about it in more detail, HERE. 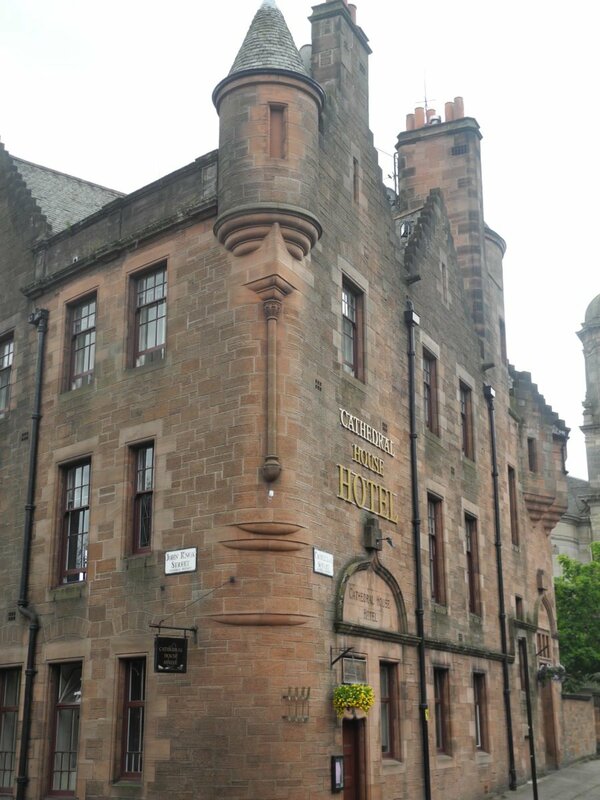 Briefly, we loved The Kirklee Hotel and it is ideal for staying in Glasgow with kids. 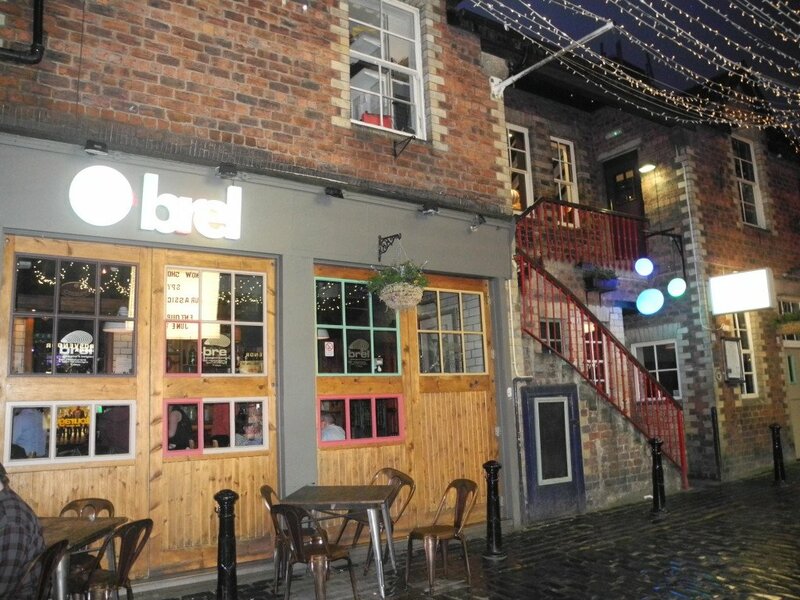 It is set in a beautiful residential neighborhood, giving you the experience of living in Glasgow’s West End. It was too far off of Byres Road for Papa to walk it, but taxis are cheap, abundant and punctual. The décor is really fun and screams, “I’m in Scotland!! !” The owners, Douglas and Rosemary, are wonderful and their staff is super friendly and accommodating. You can’t beat free breakfast! Delicious and delivered every morning to your room. There are literally hotels on every street, on every corner, so finding a place to stay is really easy. Our only issue was finding a hotel that had rooms large enough to accommodate a group our size. We are used to staying in one room on our trips. A standard room with two queens (or even two doubles) fits us normally, but European standards are significantly smaller than in the US. Even the “family” size rooms in many of the hotels didn’t have enough sleeping space. The Kirklee Hotel was one of the few that could fit us in one room. Check rates and availability. Where do I start?? 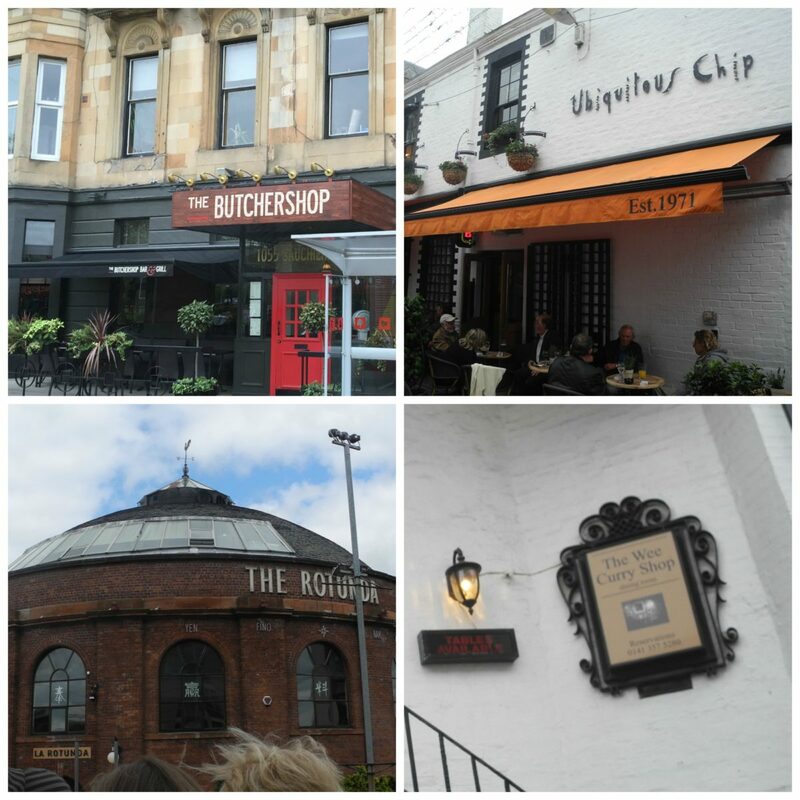 There are so many awesome Glasgow restaurants! I mean for the foodie, it is heaven on earth! I did not have one bad meal the entire 2 1/2 weeks. Simply put, I ate really well and so did the kids. FireCracker loved the Fish & Chips and Ale Steak Pies. CuddleBear became obsessed with Haggis, especially when fried and rolled into balls. He would beg for his hot Haggis balls and Ginger Beer. 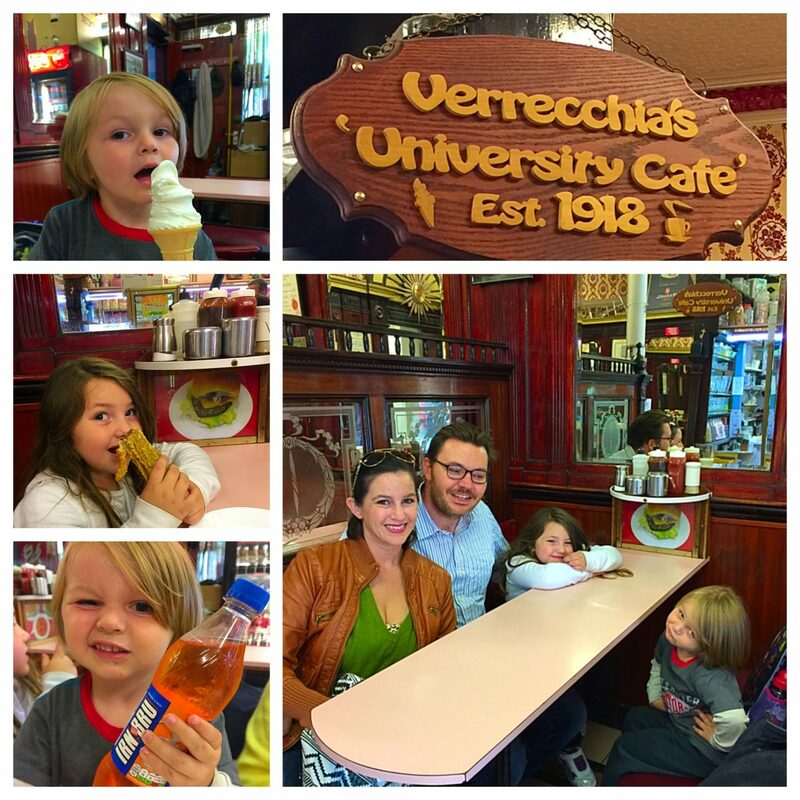 Since the dining options are endless, the easiest thing is to tell you our favorite Glasgow resturants. 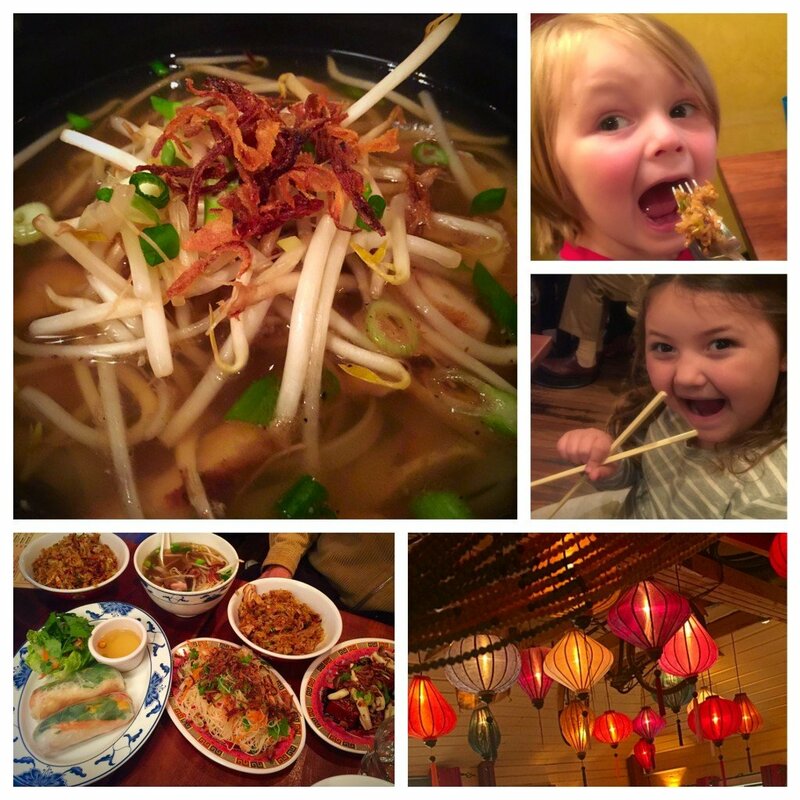 HotMama Tip: Many of the restaurants in Glasgow are fun places for kids! They promote kid-friendliness by providing play rooms loaded with goodies to keep little ones entertained. Also, every kid’s meal comes with dessert! The kids LOVED it, since they rarely get dessert at home. HotMama Tip: When traveling with kids, check with the staff on the kids’ cut off time. Many establishments require kids to be out by 8:00pm. Beautiful, cozy décor with a kilted staff. 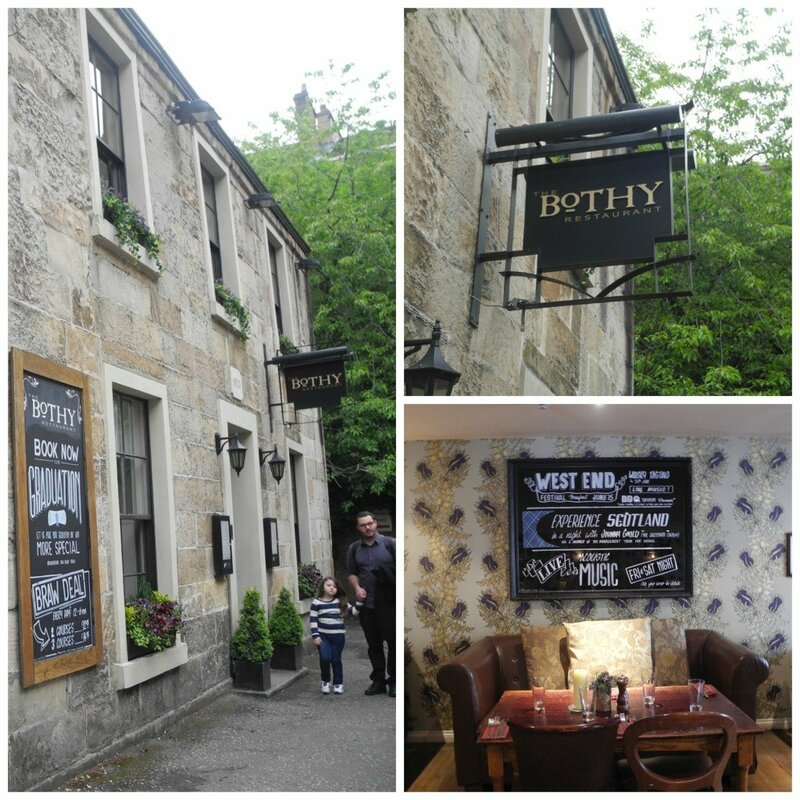 The food at the Bothy was amazing. This was where CuddleBear and Firecracker first tried Haggis for the first time and loved it! 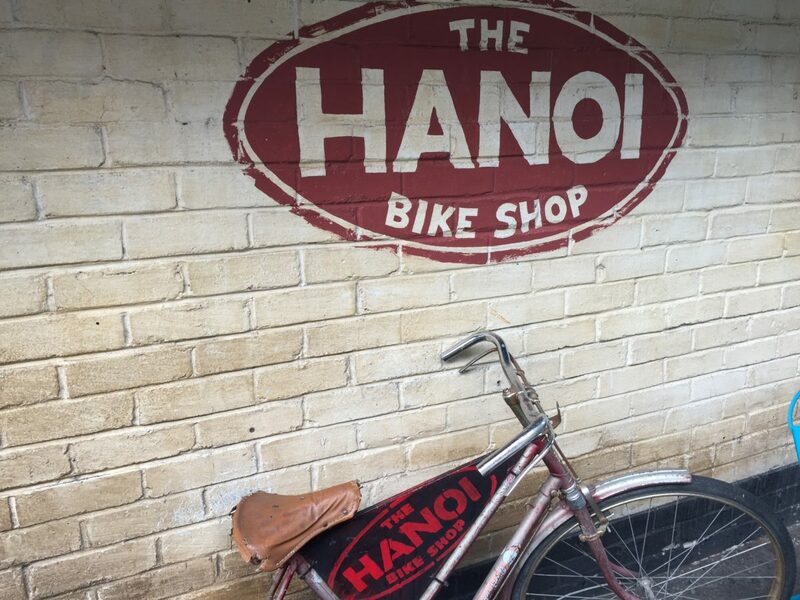 Really delicious and authentic Vietnamese cuisine can be found at the Hanoi Bike Shop restaurant. The décor is funky with lanterns, tools and bikes hanging from the ceiling. We ordered family-style and I got a little excited and went a bit overboard. 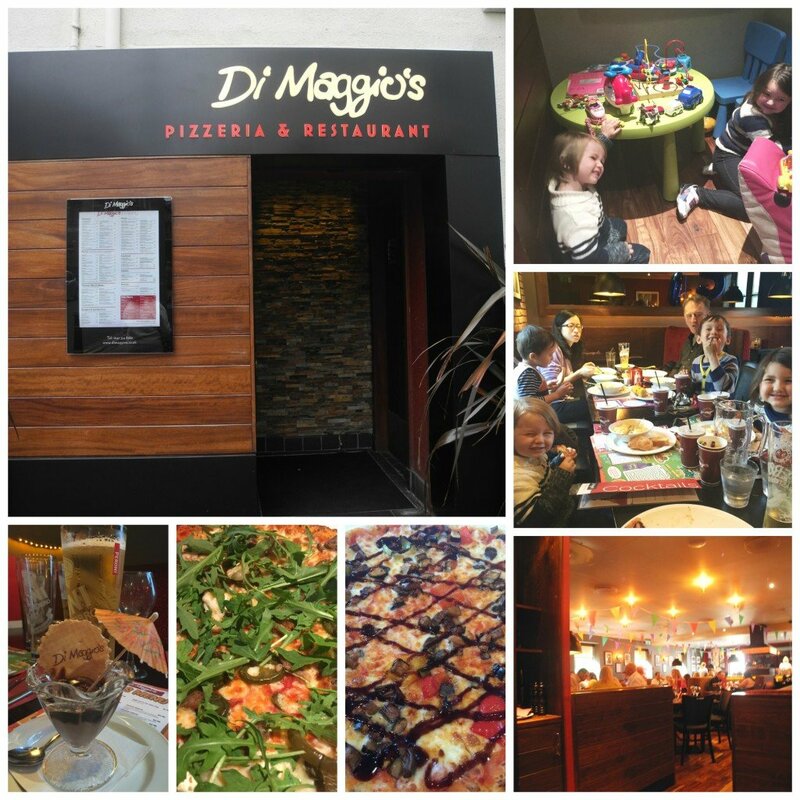 DiMaggio’s was one of the Italian restaurants in Glasgow that became the kids’ favorite. They loved the macaroni and cheese and pizza as well as the play room. We were even lucky enough to get an impromptu magic show from a professional magician disguised as a balloon animal maker during dinner here. You can watch a video of our magic show experience on our HotMamaTravel YouTube channel HERE. 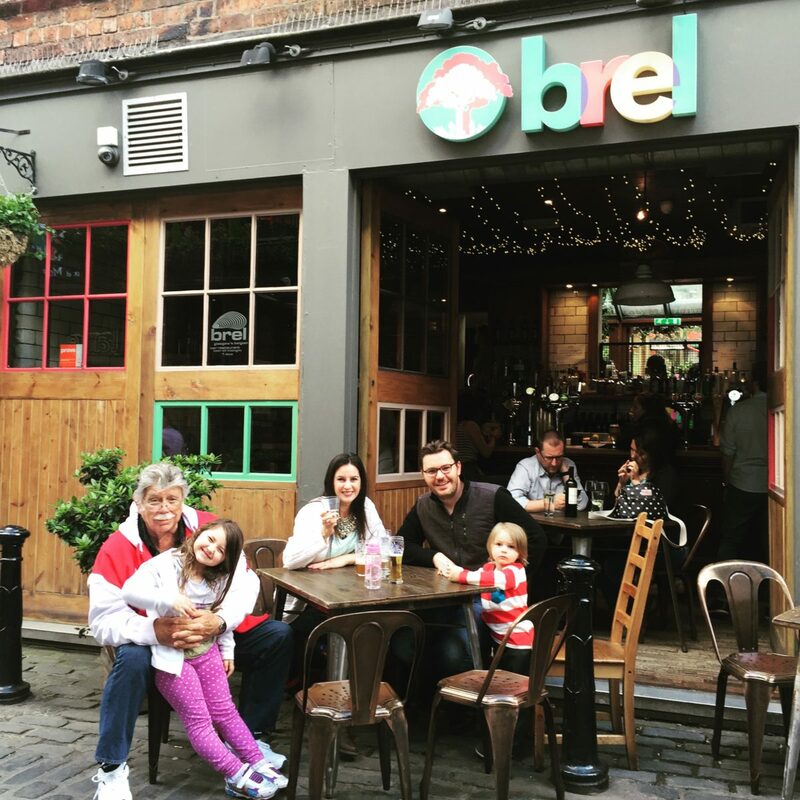 Brel has great outdoor seating right on Ashton Lane, plus it is a premiere place in Glasgow to get fondue!! Who doesn’t like fondue? 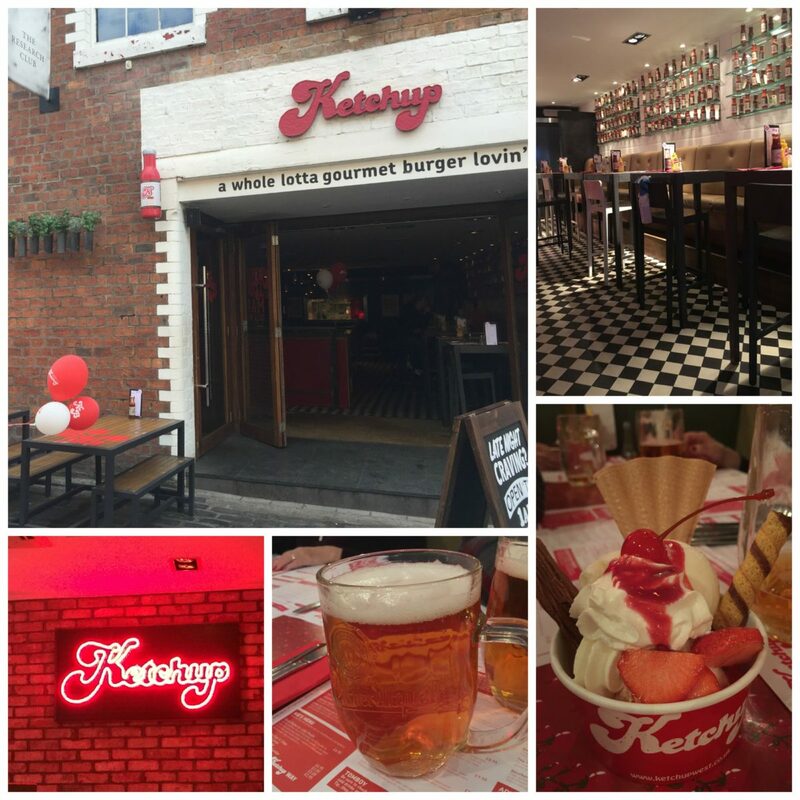 Ketchup is a fun burger joint on Ashton Lane. 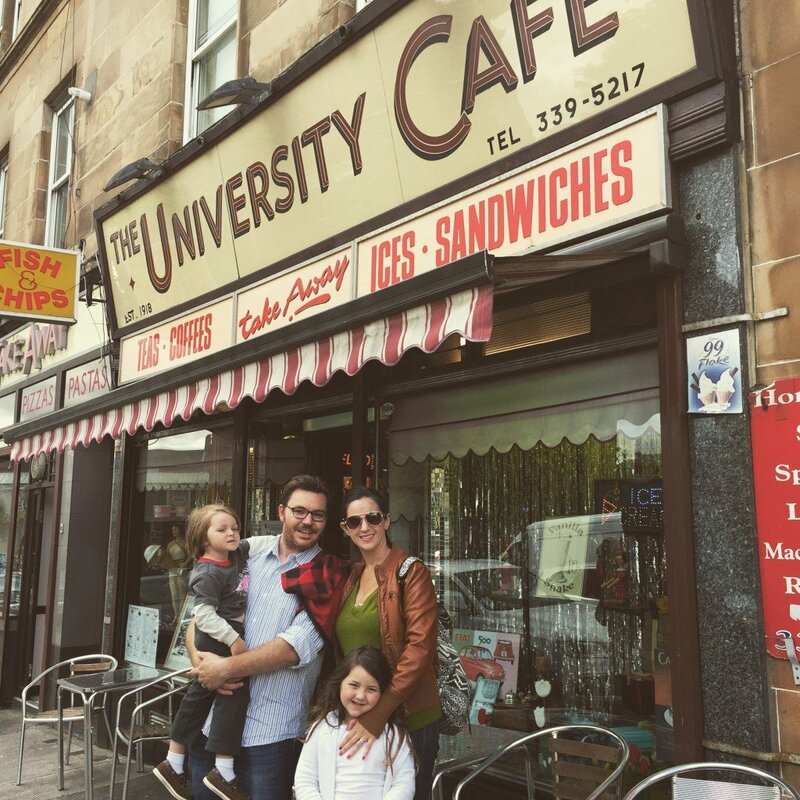 It was the first place we ate when we arrived in Scotland, which is fitting for an American family to visit a burger joint in Scotland! But seriously, the burgers were great here and the menu was extensive. 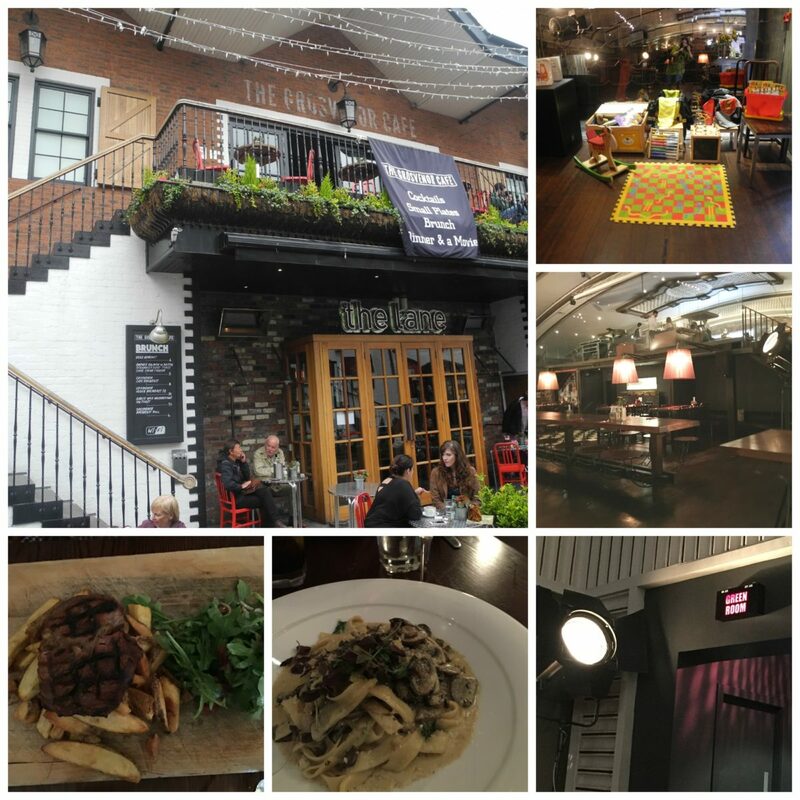 Connected to the Grosvenor Theater, the Grosvenor Cafe is perfect for dinner and a movie. When we went to see Jurassic World, we received 50% off our tab at the restaurant, which feels like you are on a movie set. Established in 1918, it is somewhat of an institution and attracts many famous customers. Very casual, it is the place to go for deep-fried Mars bars and deep-fried pizza. Emphases local and seasonal produce in an elegant, yet cozy atmosphere. Can’t go wrong with Chinese food! What I loved about this place is they delivered and we ordered from them a couple times! 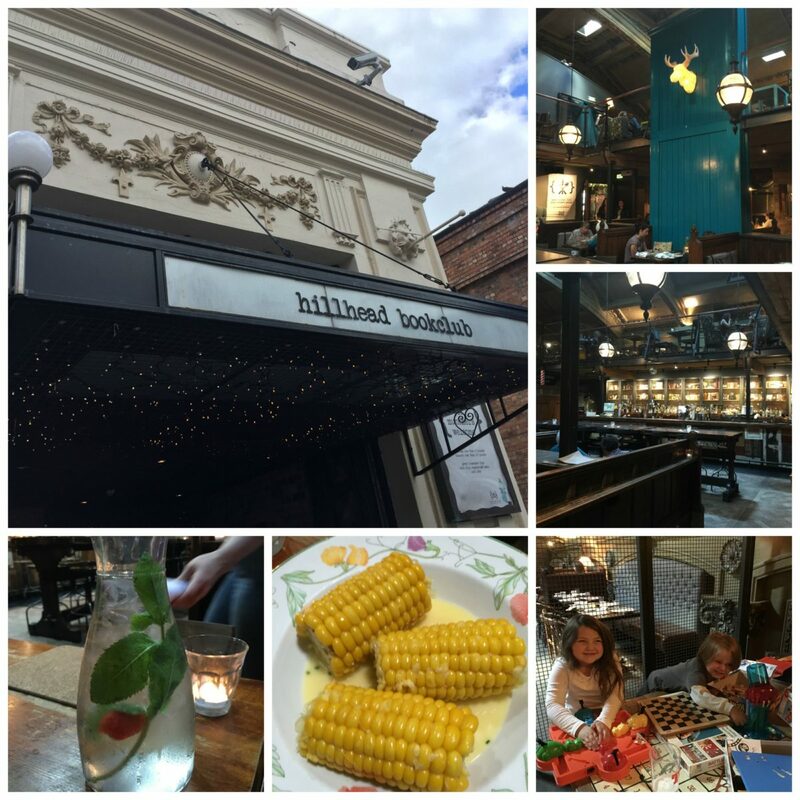 The Hillhead Book Club has really cool décor, a great cocktail list, cheap beer and a playroom! We liked it so much, we actually ate here twice in the same day, which we have literally never done anywhere else! An actual old time Schoolhouse, the Old Schoolhouse restaurant has really reasonable food and drink with huge portions! I mean the fish & chips were crazy!! This place is definitely a popular college hangout, but we enjoyed the exuberant atmosphere. 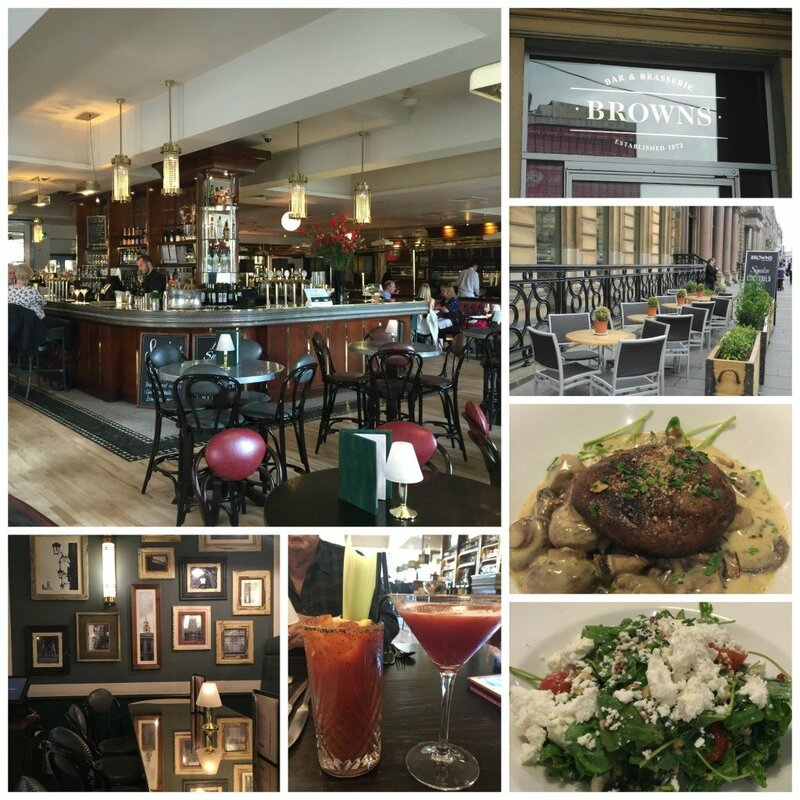 Browns is very elegant, featuring cocktails for 5 GBP. 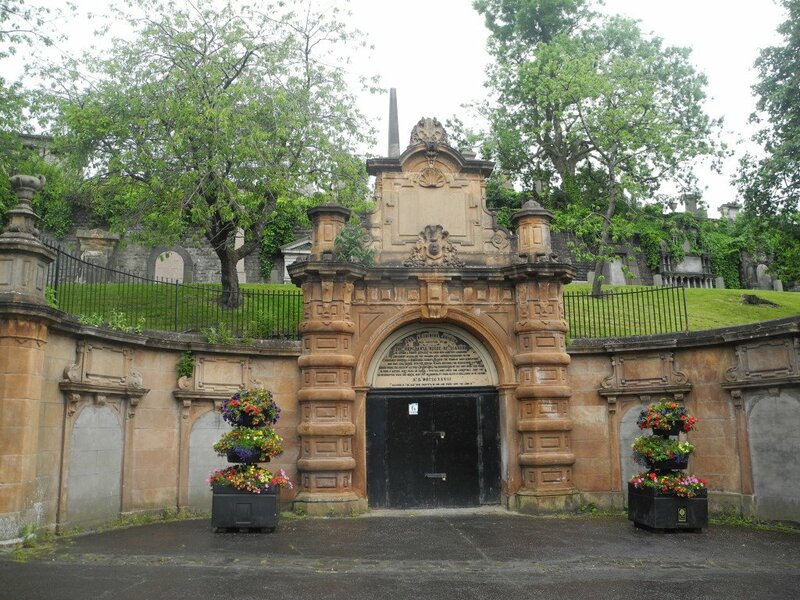 The location was great, right off of George Square, near the bus stop and Queen Street Train Station. It was a perfect place to stop after a long day of touring Scotland by train, because it was right off the platform. 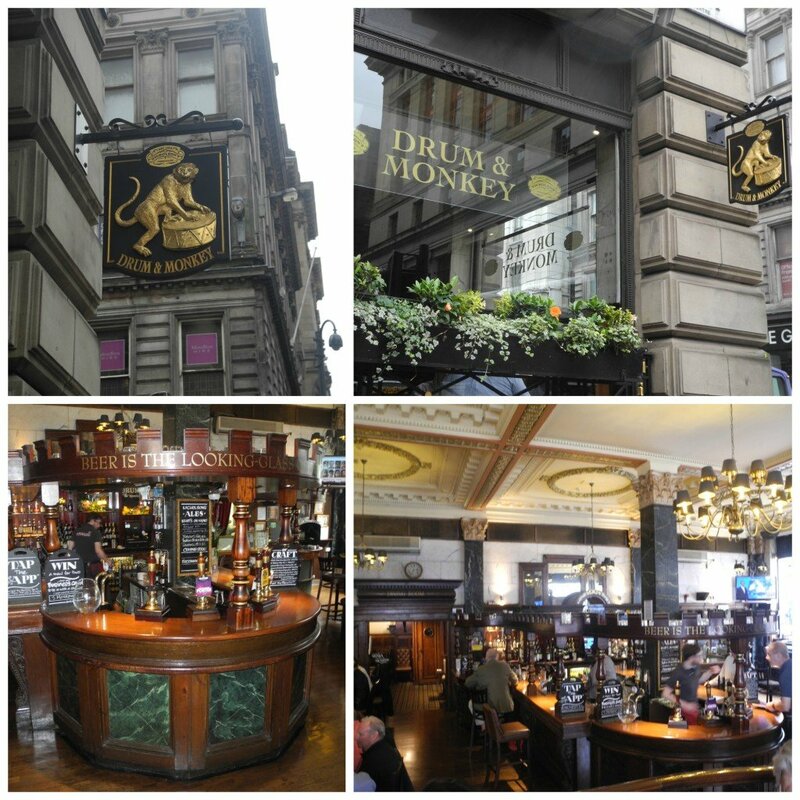 My friend, a Glaswegian, recommended the Drum & Monkey specifically as must see in Glasgow, as it is his favorite pub when visiting home. I made it a point to check it out and I am sure glad I did! Love the atmosphere and loved the deals. 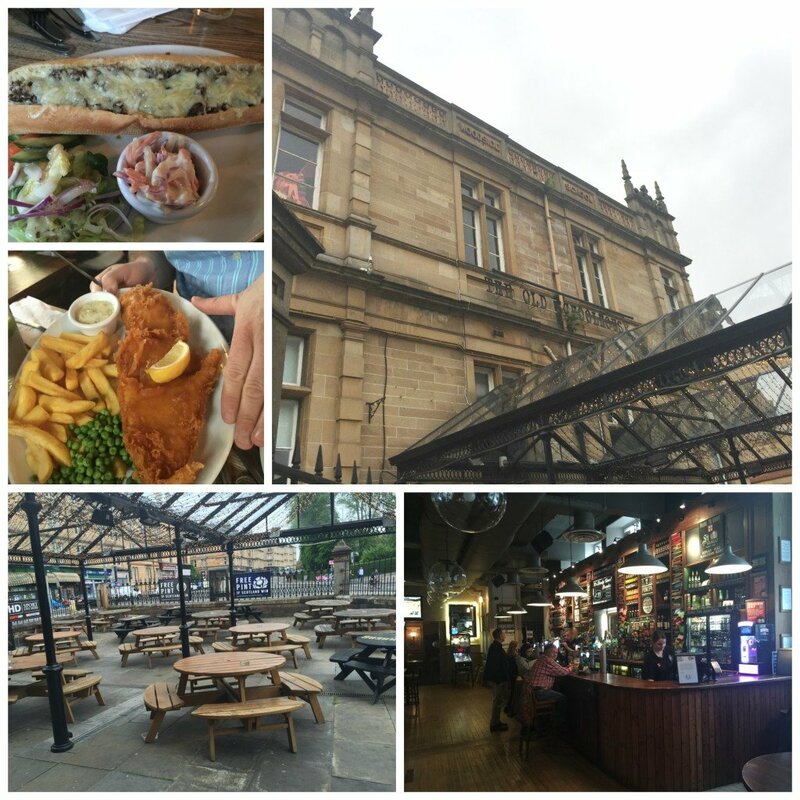 There is a meal and a pint menu that is really awesome and a great value. The Cathedral House Hotel & Restaurant is located right by the Glasgow Cathedral and Necropolis. This is where CuddleBear’s favorite Haggis was located. On my list was Butchershop, Ubiquitous Chip, Stravaigin, the restaurants in the Rotunda, the Wee Little Curry Shop and Ashoka. Glasgow is known for having some of the best Indian food around and I’m so bummed I didn’t get a chance to dine at one of them. Next time. 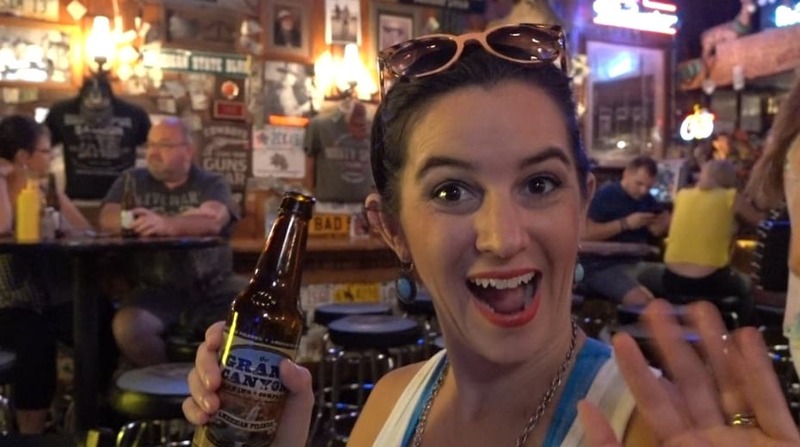 Finding a place to drink is as easy as stepping outside. 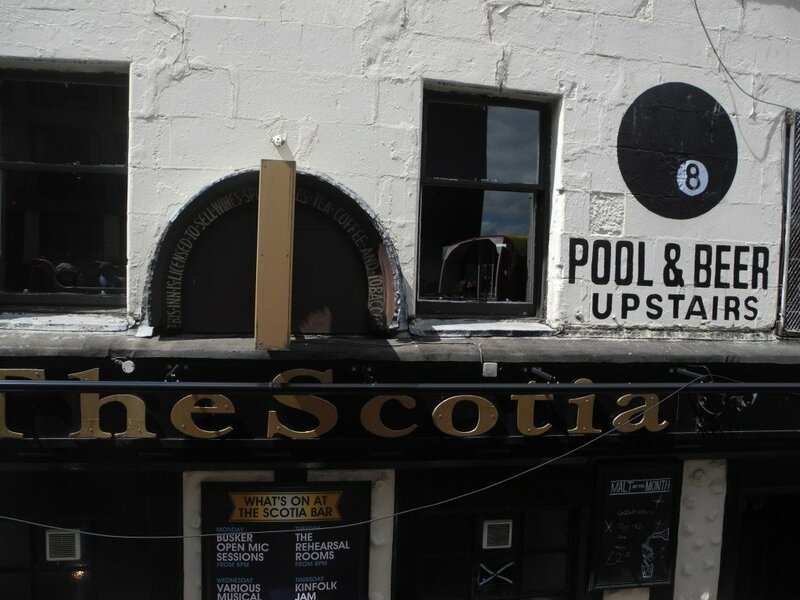 There are exciting Glasgow pubs all over the city to quench your thirst. Drinking in Scotland is pretty reasonable, compared to California. If you pop in during happy hour you are really lucky!! We had a ball tasting new Scotches and local brews. Our favorite whisky was Oban, Glengoyne and GlenMorangie. Our favorite brews were the local Tennents and Innis & Gunn. I even had a beer that has been brewed in Scotland since 2000 B.C, called Fraoch.To take a Tennents tour and beer masterclass. Book tour. Read more about my favorite Scottish cocktails, HERE. 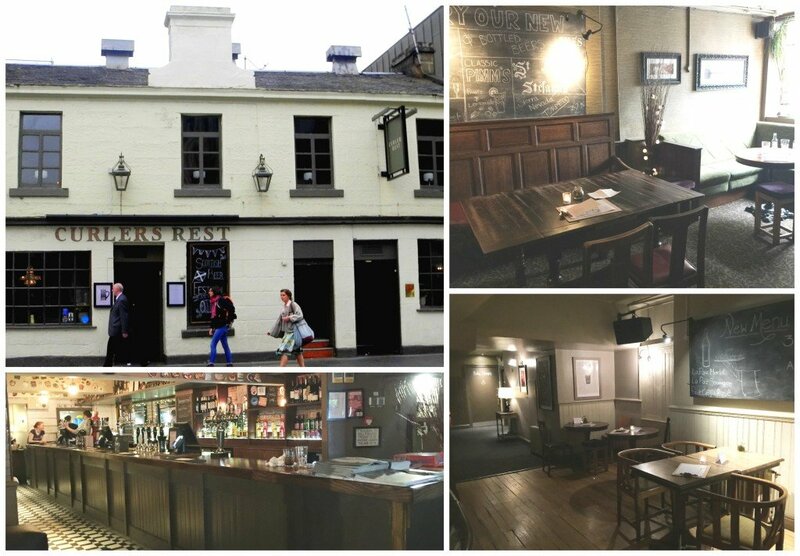 Here is a list of some of the best pubs in Glasgow. If traveling with kids you can’t really partake in Glasgow nightlife, due to strict licensing laws. Some pubs don’t allow kids at all and most have an 8:00pm cut-off time for kids to be in establishments where alcohol is sold. Licensing laws require pubs to stop selling alcohol by midnight and stores to stop selling alcohol by 10:00pm. The oldest pub on Byres Road and said to be haunted, Curler’s Rest was our favorite place for a night cup (or a before 8:00pm drink haha). During the week they have $1 off beers and drams of really nice whisky were inexpensive. I loved ending my day at Curler’s with a pint of Innis & Gunn and a dram of Oban. 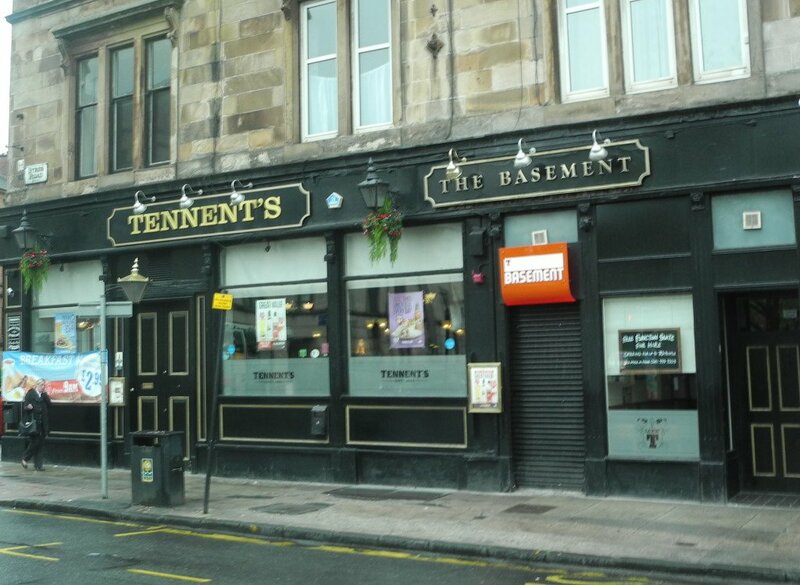 Tennents is a flagship beer of Scotland and one of Glasgow’s most popular pubs. My friend begged me to visit, but kids aren’t allowed on the premise, so I never had the chance to enjoy a pint inside the famous pub. However, I did stand in front and take a picture! Ha. 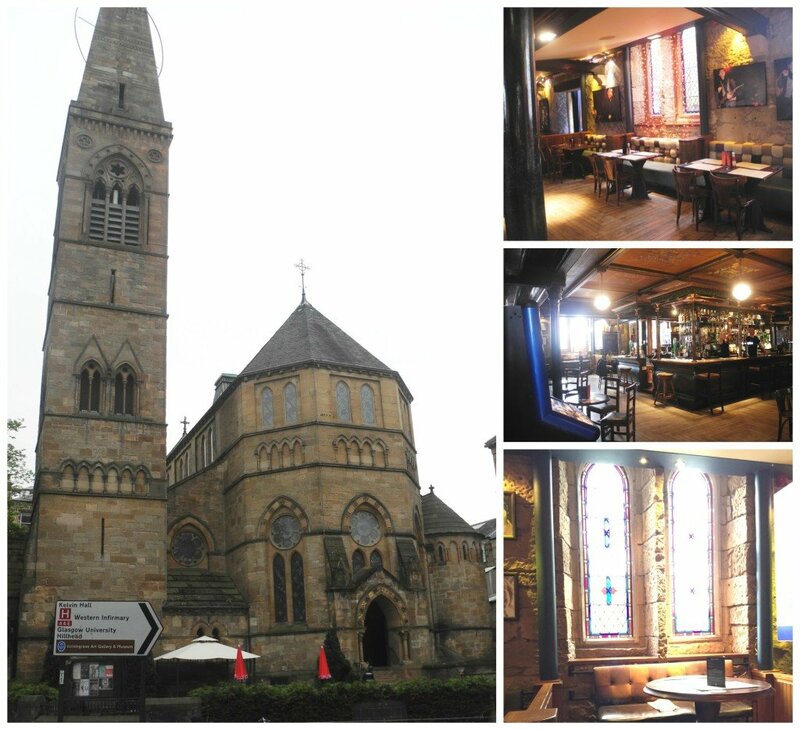 Oran Mor is an old church with a really cool bar! We went once toward the end of the trip because it was right next to our hotel, the Kirklee, and wish we would have visited more. Open pretty late and visited by a more upscale crowd when we were there. 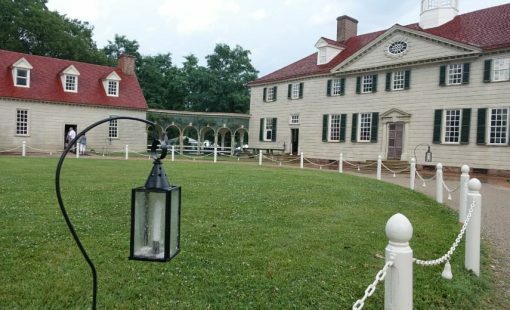 They also have concerts in the historic building some nights, so check out their events list. 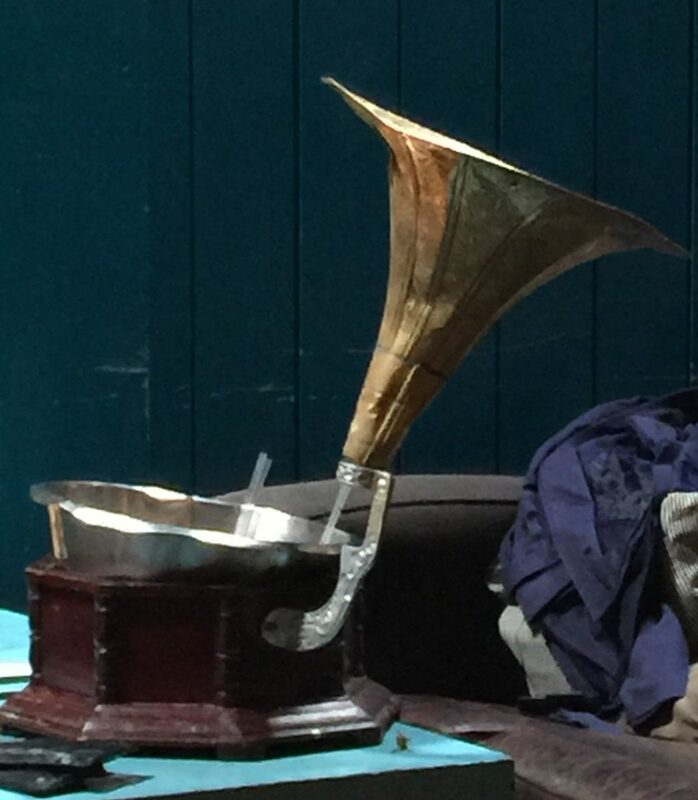 Great cocktails, cheap beer and the GRAMOPHONE!! They fill this thing with cocktails, enough for at least two. 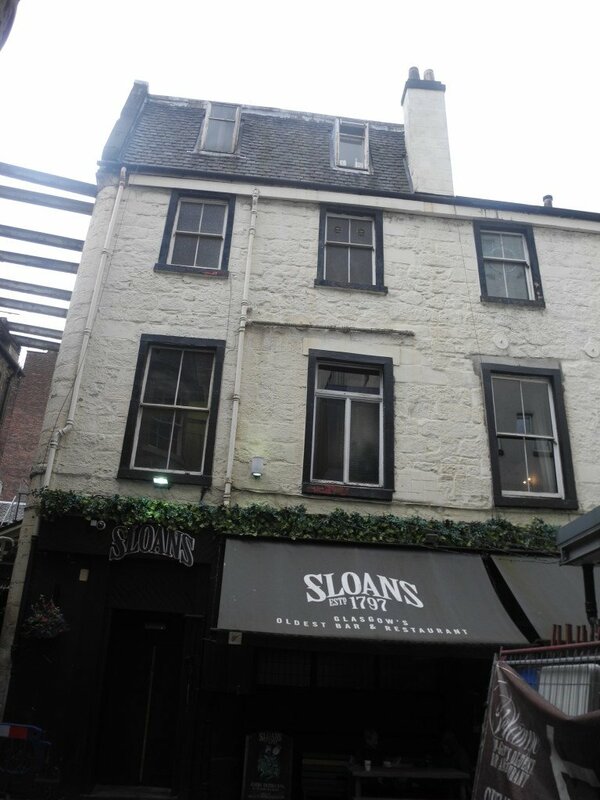 These are two pubs I had to mention, but I actually never got to the chance to have a drink in.Two of the oldest pubs in Glasgow and allegedly haunted! Don’t trip, you fall on a pub! Haha! Another classic sipper in Glasgow is tea and there are tea houses all over the city to enjoy some afternoon tea-service. 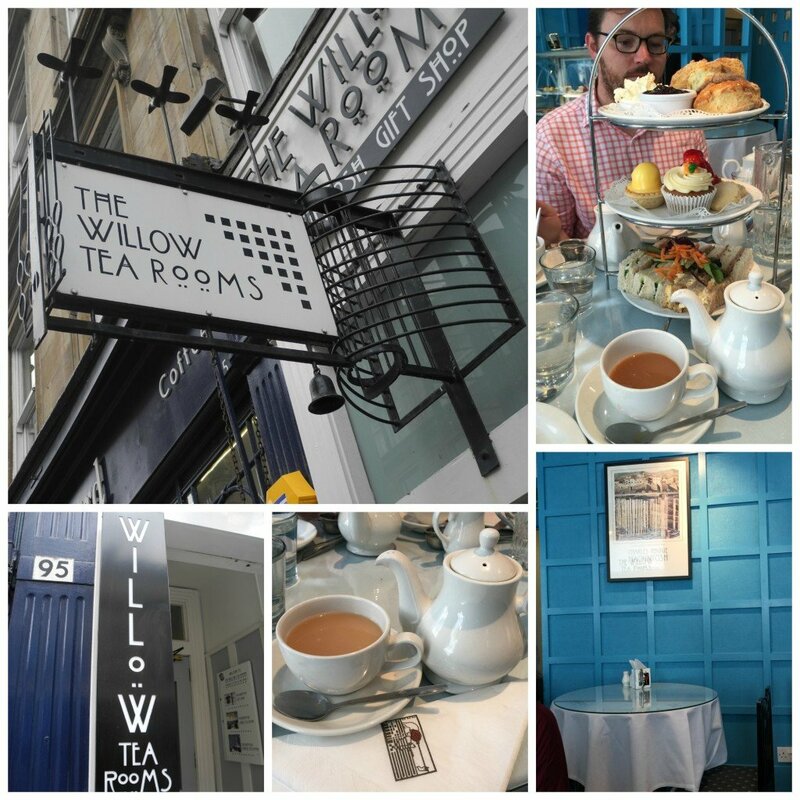 We had afternoon tea at the famous Willow Tea Rooms on Buchanan Street, designed by the famous architect Charles Rennie Mackintosh. There are so many things to do in Glasgow you may not have enough time do it all! 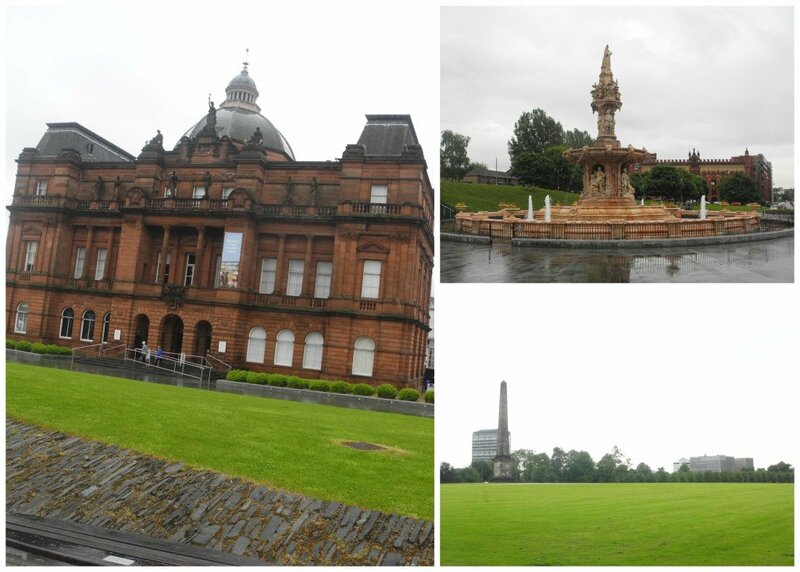 Glasgow attractions include: historical sites, museums, amazing architecture, gardens, shopping and so much more. Everything is a short taxi, subway, train, or bus ride away. 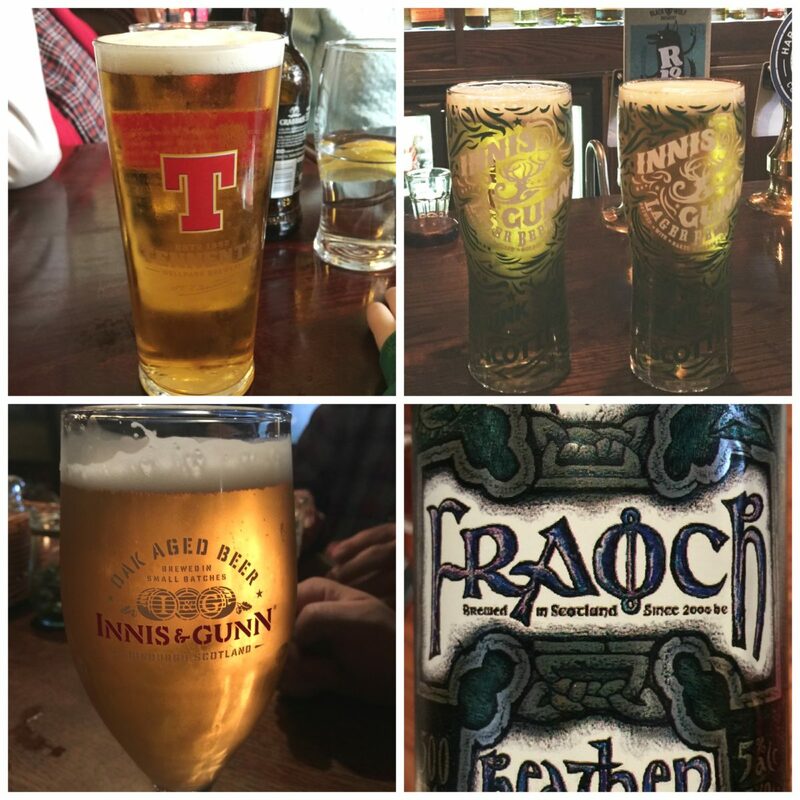 Here is my picks for what to do in Glasgow. Most Museums are free! I didn’t think I was going to see many museums, but we wound up loving them and hit quite a few. Hunterian Museum was Papa’s favorite. He loved the old Roman ruins, and the kids loved seeing the ancient mummy and dinosaur bones. HotDaddy loved seeing the historical medical and scientific instruments. 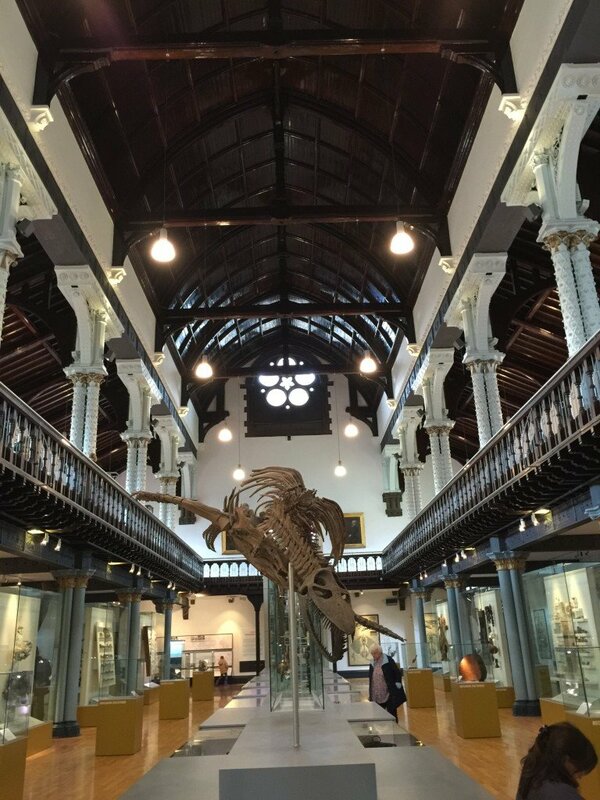 A very unique and beautiful collection can be found at the Hunterian. 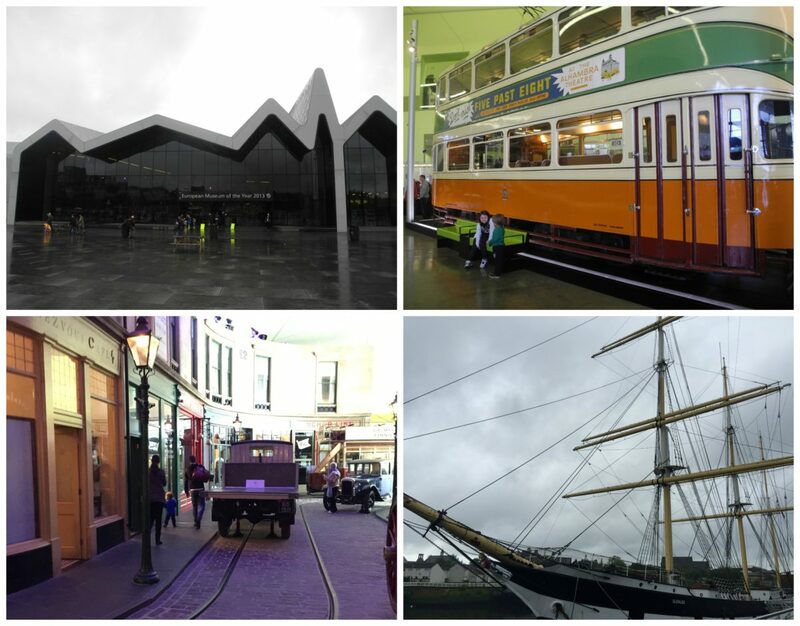 The Riverside Museum displays Glasgow transportation throughout the decades and even has a reproduction of an old Victorian street with shops to explore. There is also the Tall Ship to check out. The People’s Palace Museum takes you through daily life through time. Most fascinating for us was seeing the WWII bunkers. The Green is where the Jacobites rested before their final defeat. The most famous second had street market on the weekends. I wanted to see the Fossil Grove where prehistoric forest is preserved, but didn’t have time. Also, you can see a real Tenement House just as it was in the early 1900’s. 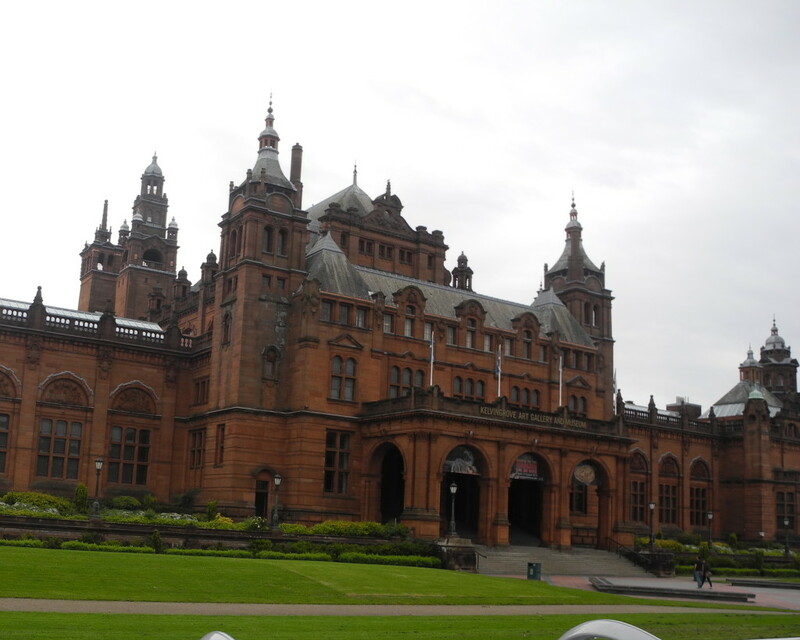 Here is a list of more Glasgow Museums. There are parks and greens everywhere, making for many affordable places to take kids. The kids love a playground and it’s a peaceful and beautiful way to spend a kids day out. The Botanical Garden was really close to our hotel and somewhere we frequented often. The grounds were gorgeous, there was tea house that Papa could enjoy, and there was a play ground my kids LOVED. History is everywhere, which is one of my favorite things about sharing the experience of Glasgow with kids! This is the best way to get see the whole city in one or two days. I actually bought four days of passes, because it was so easy for me to take the kids around the various Glasgow points of interest. It is a hop-on hop-off bus with 28 stops. Book your tickets. 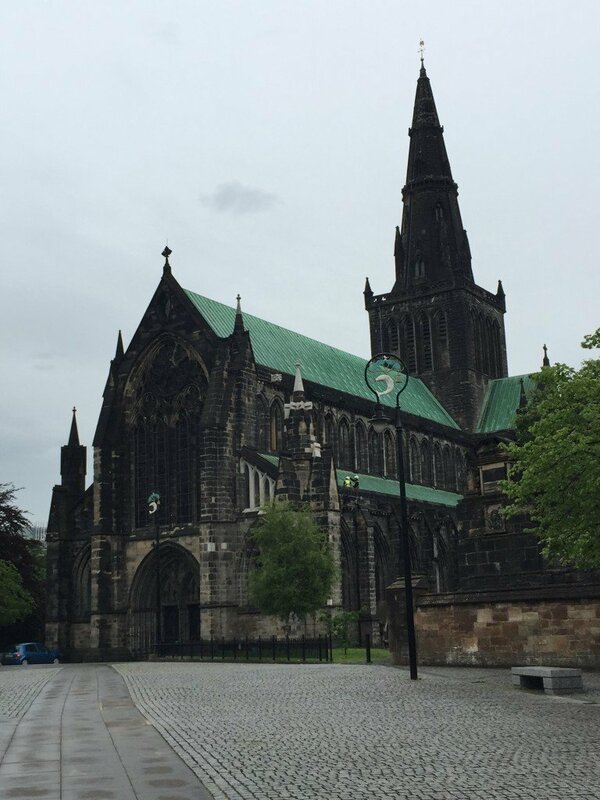 The Glasgow Cathedral, also known as St. Mungo’s Cathedral, was one of my favorites! Built in 1206, there was so much history it was hard to comprehend it all. 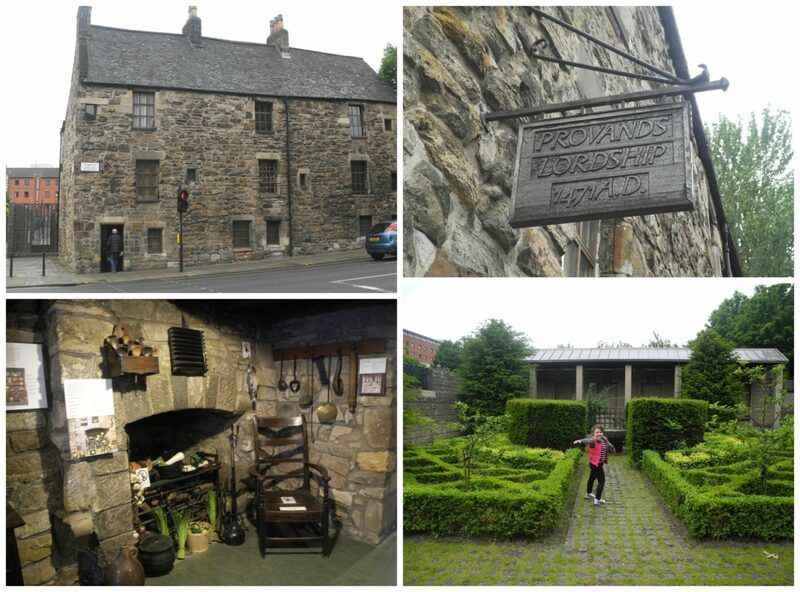 Provand’s Lordship is one of the oldest houses in Glasgow and where Queen Mary of Scots spent some of her days. 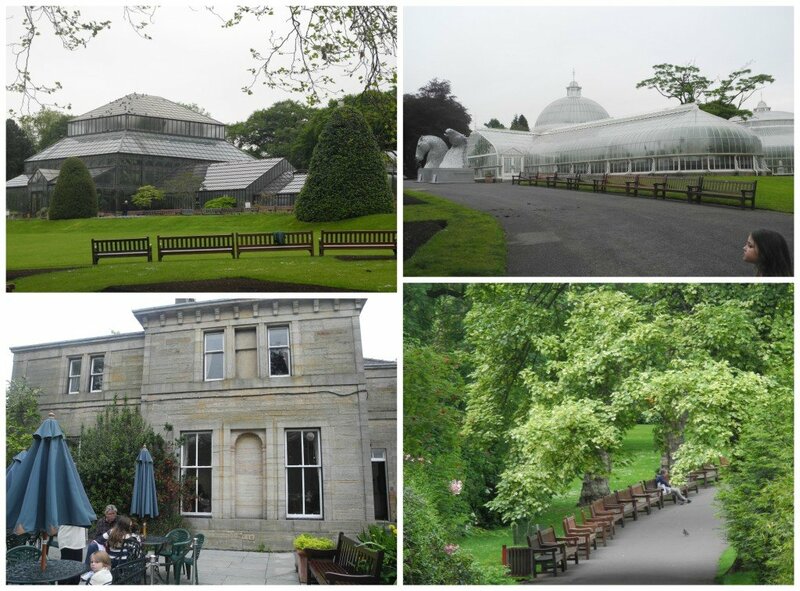 Glasgow is close to other points of interest outside the city and make for fun day trips. If you are going to be Scotland for a few days and plan on doing a lot of sightseeing, I recommend getting the Historic Scotland Explorer Pass. 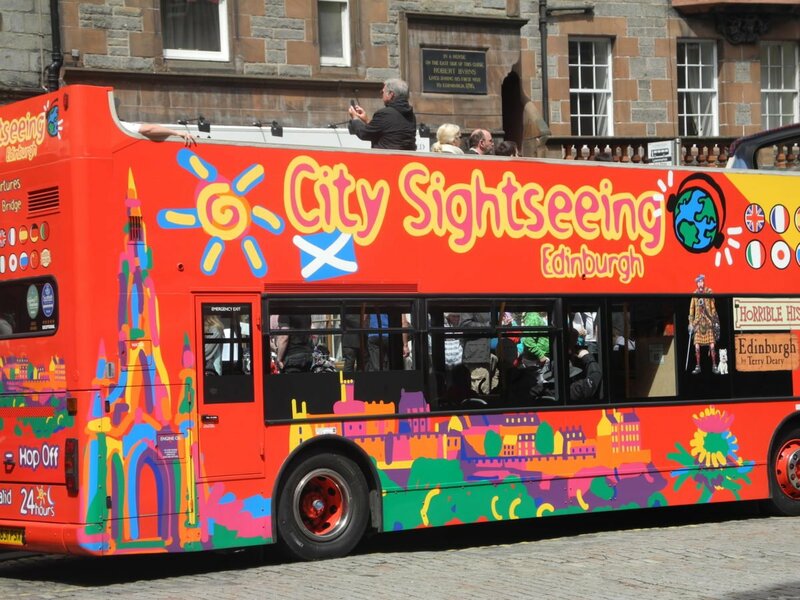 It is the most cost effective way to see some of the best Scotland attractions. You can customize your itinerary into 3 to 7 day passes. Get your Explorer Pass here. 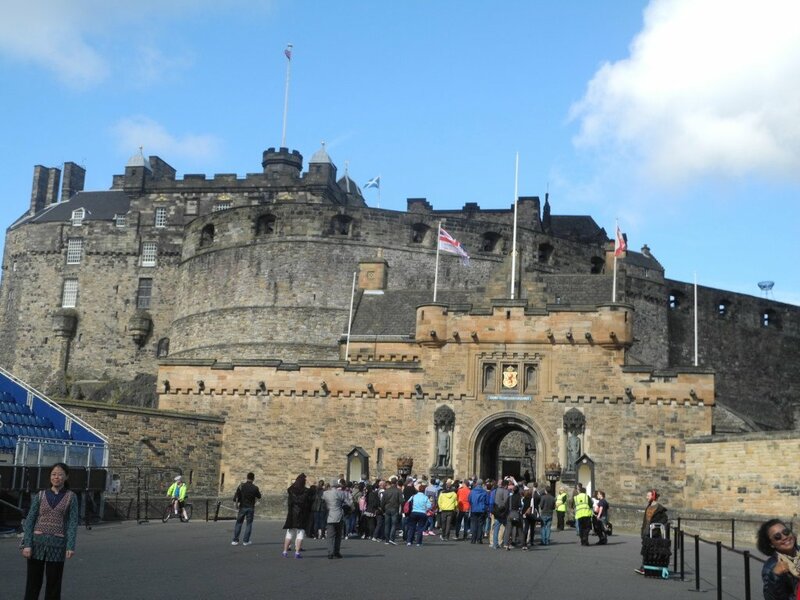 Discover Scotland is a fabulous tour company that takes you all over with set itineraries that make it easy to see a lot of stuff in one day. They even offer three day tours that take you out to the islands. We booked a highland tour which took us up to Oban. Along the way we saw Inveraray Castle, Bruce Cathedral, Kilchurn Castle, Oban for lunch, Castle Stalker, Glencoe, The Drover’s Inn and Luss on Loch Lomond. 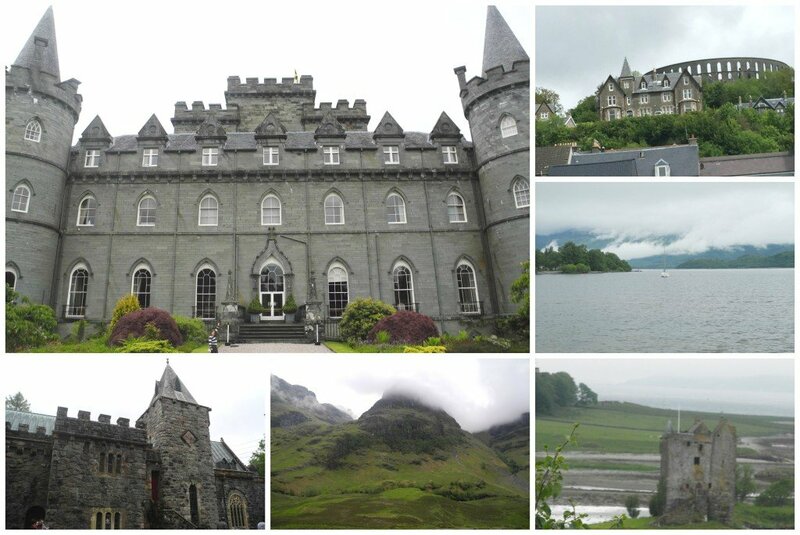 Discover Scotland is a small family owned business, so availability may be limited. 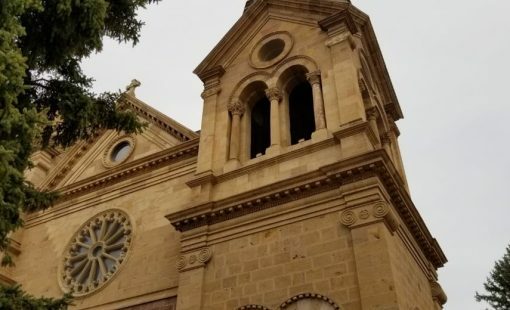 However, you can find similar day trip tours on Viator. Check prices and tours. It gets cold in the Scottish Highlands, even in the summer. So be sure to dress in layers and keep warm. Might as well look cute too! Scotrail is simple, efficient and inexpensive. It only took us 45 minutes by rail to get to Edinburgh. Get your train tickets here. Details on Scotrail, HERE. To read about our adventure in Edinburgh, click HERE. Again took Scotrail and were in Stirling in 30 minutes. 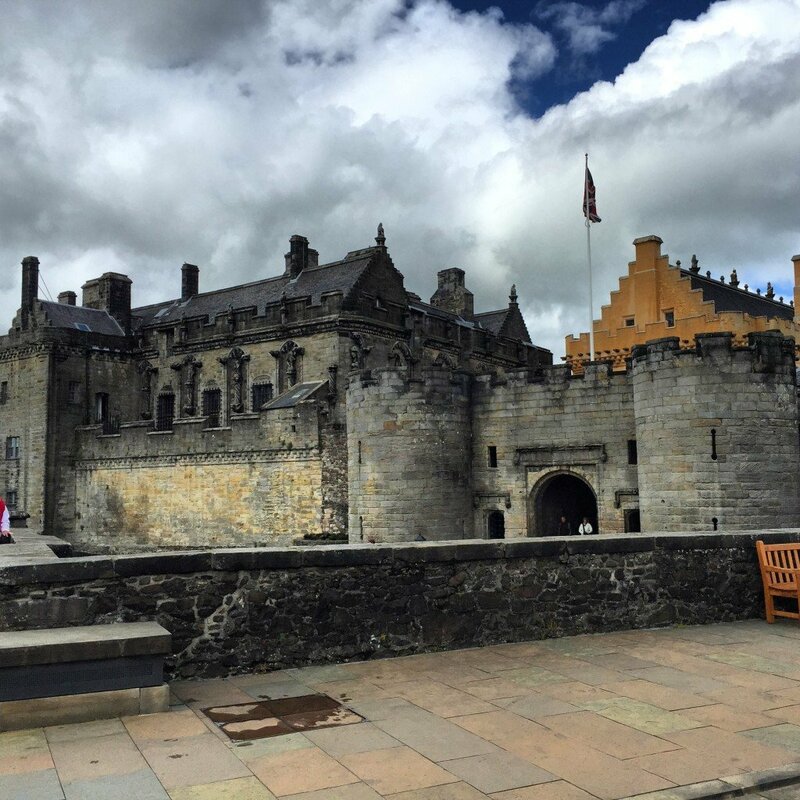 To read more about Stirling Castle, click HERE. 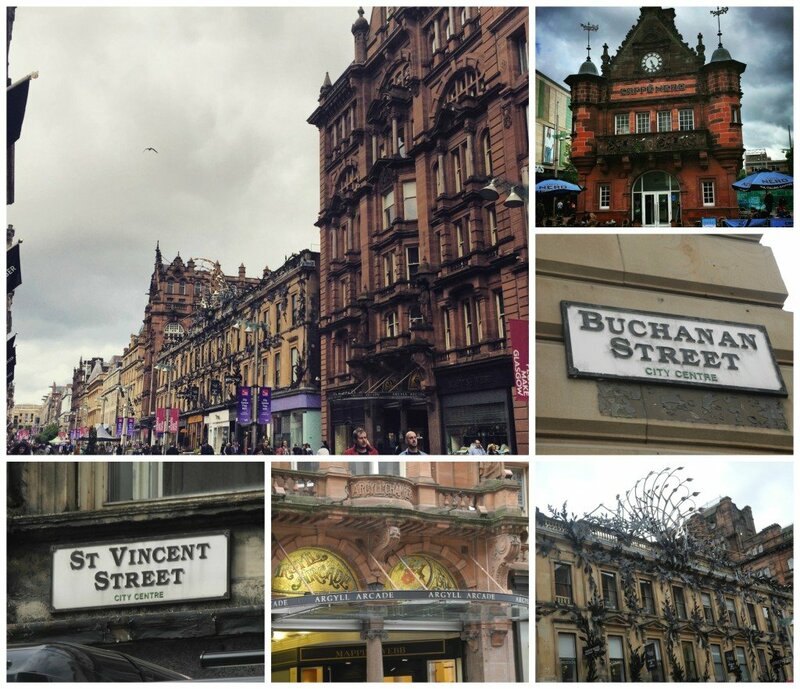 These areas are just fun, exciting and has great Glasgow shopping! 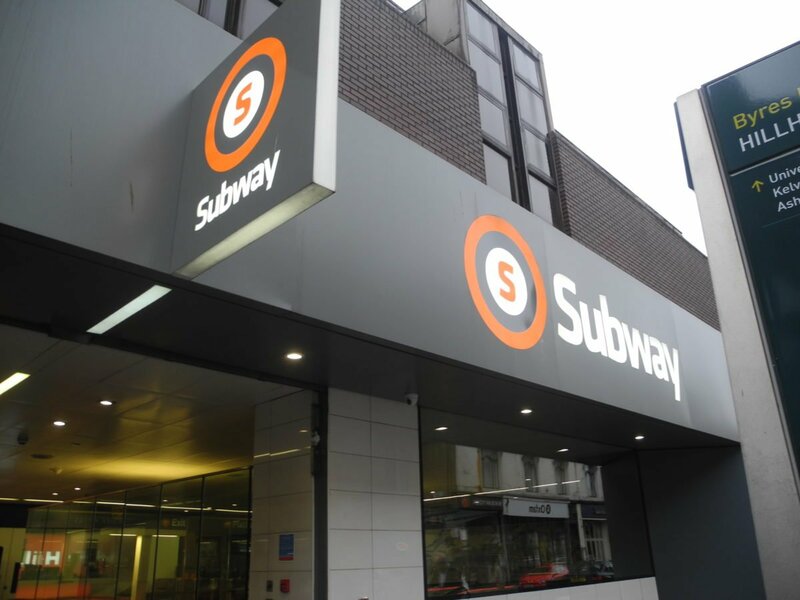 We loved taking the Subway or as Glaswegians call it, Clockwork Orange, because it is always on time, it is orange and goes around the city in a circle. It was clean, really cheap and fast! Glasgow University is also known as Hogwarts for those Harry Potter fans. HotDaddy was working here during our stay and we loved wondering around the property and visiting nearby museums. All in all Glasgow is an amazing and complex city! It will take me a few posts to cover everything we learned and did during our stay, but I can honestly say it is a wonderful place to visit. The people are friendly, the food is to die for and the options for fun are endless!!! Ever been to Glasgow, Scotland? 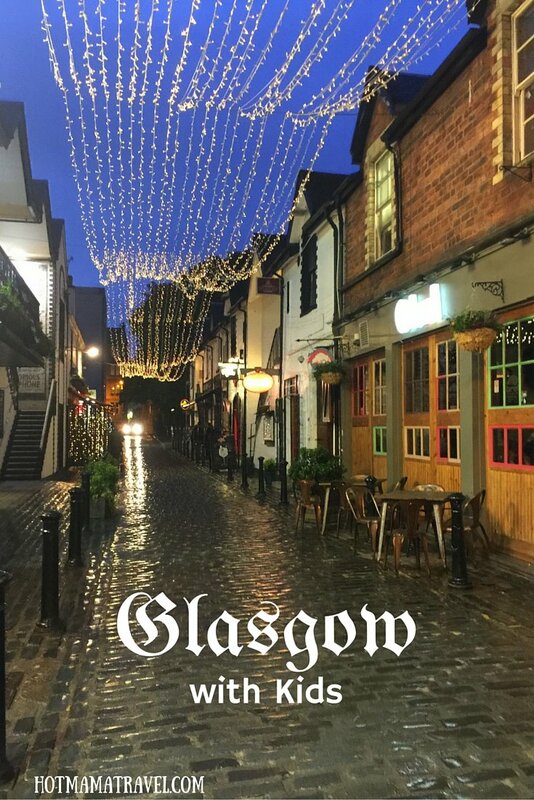 Would you like to visit Glasgow? Very good post, after reading it we can’t wait to get back there to see more of it than we did in 2014. We are visiting friends in Edinburg this year so hopefully, we can persuade them to take us there. Yeah, just a quick train ride away! 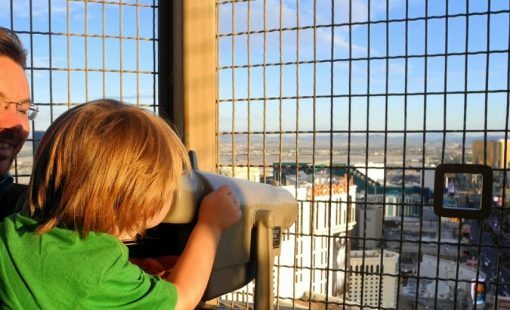 Thank you for sharing all those tips and glad you managed to enjoy another family vacation together! Oh yeah, we love to eat! Our favorite aspect of travel. The Hanoi bike shop looks cool. I saw Glasgow twice before seeing any other parts of Scotland. Since I write about train travel, I regret not getting to use the subway. I mostly walked around the center. Hanoi Bike shop was really good and the decor was just so interesting. We didn’t use the subway until the end of our trip, but it was so nice I wish we would have used it sooner. Castles, palaces and amazing food and drink. You’ve won me over on Glasgow! I see you feel the same as me! Glasgow love be strong. 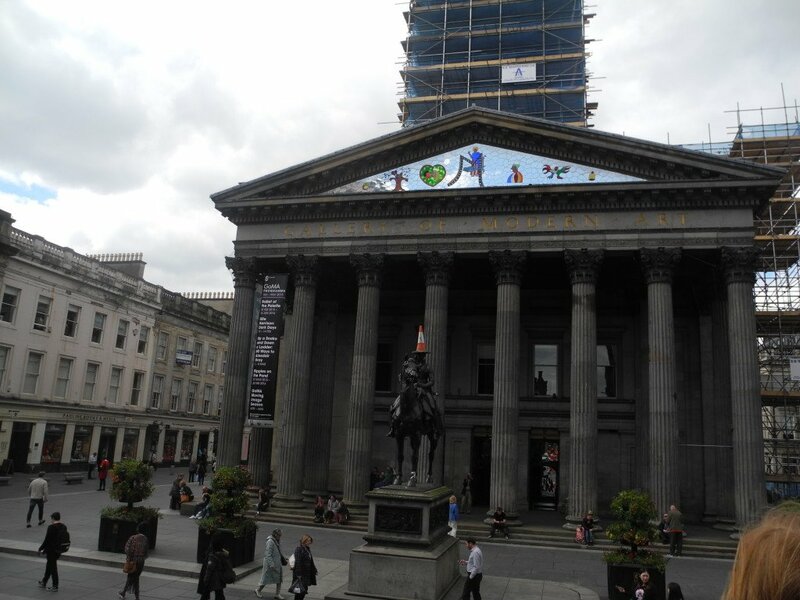 Glasgow seems like an awesome travel destination which I would love to cross off my bucket list soon! 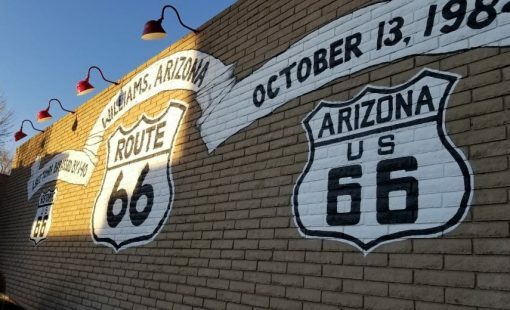 When’s the best time of the year to visit it? Thank you. You will have the “best” weather during summer although travel rates are higher at that time. Plus there are a lot of events and festivals going on in summer that are fun too. You definitely should go the next time you have a chance. I am craving to go back.